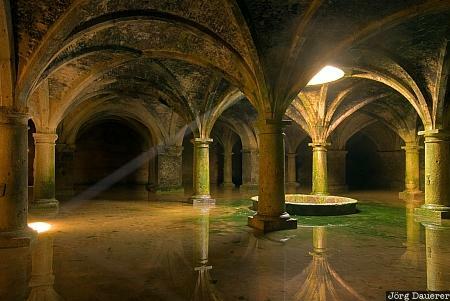 A single beam of light between columns and their reflexions in the cistern in the Cité Portugaise of El Jadida. El Jadida is in Doukkala-Abda on the Atlantic coast of central Morocco. This photo was taken in the afternoon of a sunny day in March of 2010. This photo is part of the exhibition Sun Beams (October 2011). This photo was taken with a digital camera.